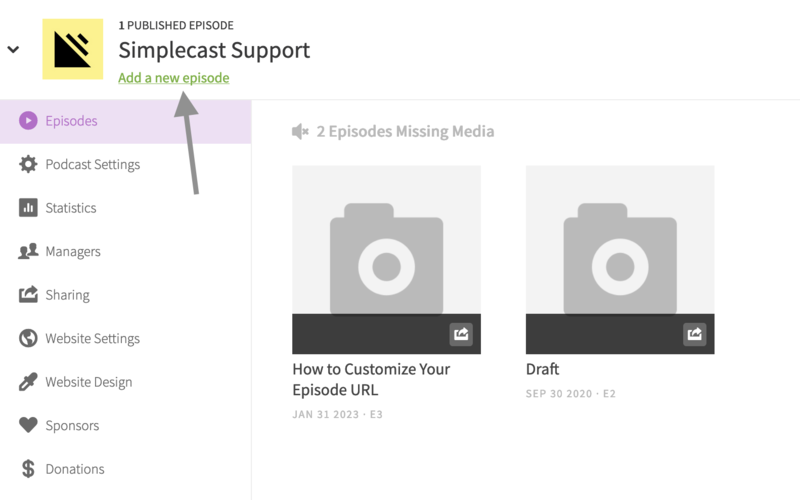 Once you have your audio file and episode notes ready, it's easy to publish a new podcast episode in Simplecast. 1. From your show's dashboard, click the "Add a new episode" button in the top-left side of your screen. 2. Enter the episode title, episode URL (optional), season number, episode number, and episode type. 3. Choose a publish date and time for the episode. 4. 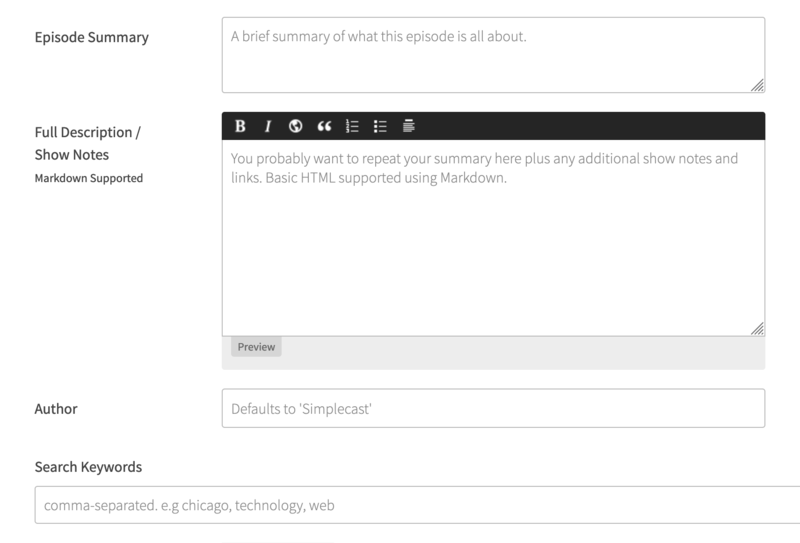 Enter your episode summary and full episode notes, then the author of the episode (optional) and any related search keywords. ⭐️ We recommend copying and pasting your episode summary and notes from a text document so you don't accidentally lose any of your work. 5. 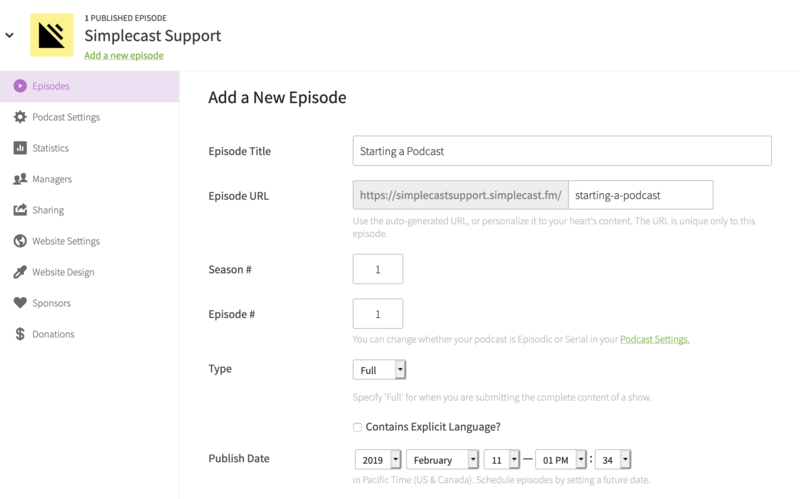 Upload your episode artwork (optional), then upload the audio file for the episode. You can replace the audio file at any time by uploading a new file (be sure to change the name of the file slightly first). If you're not sure what kind of audio file you need, click here. 6. Once the file has finished uploading, double-check your work, then click the green Save Episode button. This will save and publish the episode at the date/time you specified. If you select the current time or a time in the past, the episode will be published as soon as it's finished processing. That's it! If you've already submitted your show's RSS feed URL to Apple Podcasts or any other podcast directory, they should get your new episode from your show's feed shortly (usually within minutes, but occasionally it can take a little longer). Still have questions? We'd be happy to answer them. You can start a live chat with someone from our team by clicking the chat icon down there on the right.